These melt-in-the-mouth mini pies are quick to make, and their dainty size makes them perfect for parties or as after-dinner treats. Preheat the oven to 190°C, gas mark 5. Grease a 12-hole mini bun tin. Roll out the pastry and stamp out 12 circles using a 7cm pastry cutter. Press the circles into the tin. Using a teaspoon, fill each pastry case with mincemeat. Roll out the marzipan to 5mm thick and cut out 12 stars, using a small star cutter (about 4.5cm diameter). Lay a marzipan star on top of each mince pie and then bake for about 15 minutes, until the pastry is golden. Leave to cool in the tin for 5 minutes, then carefully lift out and place on a wire rack to cool. Dust with a little icing sugar to serve (or see Cook’s tip). 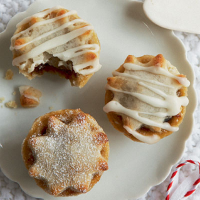 Make these mince pies even more special by drizzling with orange icing. When the mince pies have cooled, mix 50g sifted icing sugar with 2-3 teaspoons orange juice until smooth. Drizzle over the top of the mince pies and leave to set for 10 minutes.